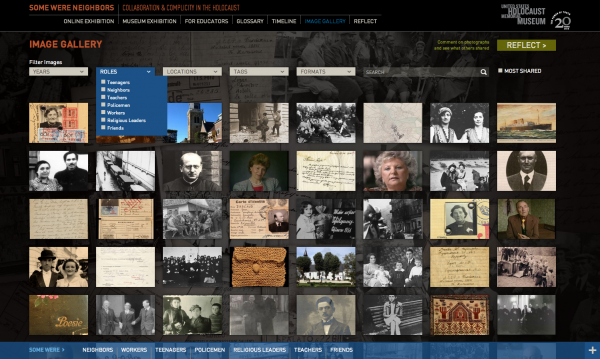 C&G Partners and the US Holocaust Memorial Museum have just won Gold tonight in the 25th Annual Muse Awards Competition, for the Some Were Neighbors website created for USHMM. This is one of several projects the firm has completed for the Holocaust Museum, and our fourth Muse award win. The award was just announced this evening at the AAM 2014 Annual Meeting in Seattle. See Some Were Neighbors here . See a short video produced by C&G Partners about the project here .This is the fourth Muse win for C&G Partners, two of which were previously won jointly with design and technology firm Potion . Our most recent Muse Award, and this Gold Muse-Award-winning project, both have C&G Partners as sole designer. About the AAM's Media & Technology Muse Awards: Recognizing outstanding achievement in Galleries, Libraries, Archives or Museums (GLAM) media, the international Alliance Media & Technology Professional Network announces the 25th annual Muse awards competition. Presented to institutions or independent producers who use digital media to enhance the GLAM experience and engage audiences, the Muse awards celebrate scholarship, community, innovation, creativity, education and inclusiveness. Projects must be produced by or for a GLAM, and may include websites, podcasts, multimedia installations, games, interactive kiosks, apps and much more. Winning projects for each category are chosen by an international group of GLAM technology professionals and the awards will be presented at the 2014 Annual Meeting and MuseumExpo in Seattle.